Another aspect of Planck’s legacy bears examining. A couple of months ago, the 2018 Gruber Prize in Cosmology was awarded to the Planck Satellite. This was (I think) a well-deserved honour for all of us who have worked on Planck during the more than 20 years since its conception, for a mission which confirmed a standard model of cosmology and measured the parameters which describe it to accuracies of a few percent. Planck is the latest in a series of telescopes and satellites dating back to the COBE Satellite in the early 90s, through the MAXIMA and Boomerang balloons (among many others) around the turn of the 21st century, and the WMAP Satellite (The Gruber Foundation seems to like CMB satellites: COBE won the Prize in 2006 and WMAP in 2012). Well, it wasn’t really awarded to the Planck Satellite itself, of course: 50% of the half-million-dollar award went to the Principal Investigators of the two Planck instruments, Jean-Loup Puget and Reno Mandolesi, and the other half to the “Planck Team”. The Gruber site officially mentions 334 members of the Collaboration as recipients of the Prize. I also understand that the PIs will use a portion of their award to create a fund for all members of the collaboration to draw on for Planck-related travel over the coming years, now that there is little or no governmental funding remaining for Planck work, and those of us who will also receive a financial portion of the award will also be encouraged to do so (after, unfortunately, having to work out the tax implications of both receiving the prize and donating it back). However, this seemingly reasonable solution reveals an even bigger, longer-standing, and wider-ranging problem: only about 50 of the 334 names on the full Planck team list (roughly 15%) are women. This is already appallingly low. Worse still, none of the 43 formerly “identified” members officially receiving a monetary prize are women (although we would have expected about 6 given even that terrible fraction). Put more explicitly, there is not a single woman in the upper reaches of Planck scientific management. This terrible situation was also noted by my colleague Jean-Luc Starck (one of the larger group of 334) and Olivier Berné. As a slight corrective to this, it was refreshing to see Nature’s take on the end of Planck dominated by interviews with young members of the collaboration including several women who will, we hope, be dominating the field over the coming years and decades. It’s been almost exactly a year since the release of the first Planck cosmology results (which I discussed in some depth at the time). On this auspicious anniversary, we in the cosmology community found ourselves with yet more tantalising results to ponder, this time from a ground-based telescope called BICEP2. While Planck’s results were measurements of the temperature of the cosmic microwave background (CMB), this year’s concerned its polarisation. Polarisation is essentially a headless arrow that can come attached to the photons coming from any direction on the sky — if you’ve worn polarised sunglasses, and noticed how what you see changes as you rotate them around, you’ve seen polarisation. The same physics responsible for the temperature also generates polarisation. But more importantly for these new results, polarisation is a sensitive probe of some of the processes that are normally mixed in, and so hard to distinguish, in the temperature. Technical aside (you can ignore the details of this paragraph). Actually, it’s a bit more complicated than that: we can think of the those headless arrows on the sky as the sum of two separate kinds of patterns. We call the first of these the “E-mode”, and it represents patterns consisting of either radial spikes or circles around a point. The other patterns are called the “B-mode” and look like patterns that swirl around, either to the left or the right. The important difference between them is that the E modes don’t change if you reflect them in a mirror, while the B modes do — we say that they have a handedness, or parity, in somewhat more mathematical terms. I’ve discussed the CMB a lot in the past but can’t do the theory of the CMB justice here, but my colleague Wayne Hu has an excellent, if somewhat dated, set of web pages explaining the physics (probably at a physics-major level). The excitement comes because these B-mode patterns can only arise in a few ways. The most exciting is that they can come from gravitational waves (GWs) in the early Universe. Gravitational waves (sometimes incorrectly called “gravity waves” which historically refers to unrelated phenomena!) are propagating ripples in space-time, predicted in Einstein’s general relativistic theory of gravitation. Because the CMB is generated about 400,000 years after the big bang, it’s only sensitive to gravitational radiation from the early Universe, not astrophysical sources like spiralling neutron stars or — from where we have other, circumstantial, evidence for gravitational waves, and which are the sources for which experiments like LIGO and eLISA will be searching. These early Universe gravitational waves move matter around in a specific way, which in turn induce those specific B-mode polarization pattern. In the early Universe, there aren’t a lot of ways to generate gravitational waves. The most important one is inflation, an early period of expansion which blows up a subatomically-sized region by something like a billion-billion-billion times in each direction — inflation seems to be the most well thought-out idea for getting a Universe that looks like the one in which we live, flat (in the sense of Einstein’s relativity and the curvature of space-time), more or less uniform, but with small perturbations to the density that have grown to become the galaxies and clusters of galaxies in the Universe today. Those fluctuations arise because the rapid expansion takes minuscule quantum fluctuations and blows them up to finite size. This is essentially the same physics as the famous Hawking radiation from black holes. The fluctuations that eventually create the galaxies are accompanied by a separate set of fluctuations in the gravitational field itself: these are the ones that become gravitational radiation observable in the CMB. We characterise the background of gravitational radiation through the number r, which stands for the ratio of these two kinds of fluctuations — gravitational radiation divided by the density fluctuations. Important caveat: there are other ways of producing gravitational radiation in the early Universe, although they don’t necessarily make exactly the same predictions; some of these issues have been discussed by my colleagues in various technical papers (Brandenberger 2011; Hindmarsh et al 2008; Lizarraga et al 2014 — the latter paper from just today!). However, there are other ways to generate B modes. First, lots of astrophysical objects emit polarised light, and they generally don’t preferentially create E or B patterns. In particular, clouds of gas and dust in our galaxy will generally give us polarised light, and as we’re sitting inside our galaxy, it’s hard to avoid these. Luckily, we’re towards the outskirts of the Milky Way, so there are some clean areas of sky, but it’s hard to be sure that we’re not seeing some such light — and there are very few previous experiments to compare with. We also know that large masses along the line of sight — clusters of galaxies and even bigger — distort the path of the light and can move those polarisation arrows around. This, in turn, can convert what started out as E into B and vice versa. But we know a lot about that intervening matter, and about the E-mode pattern that we started with, so we have a pretty good handle on this. There are some angular scales over which this is larger than the gravitational wave signal, and some scales that the gravitational wave signal is dominant. So, if we can observe B-modes, and we are convinced that they are primordial, and that they are not due to lensing or astrophysical sources, and they have the properties expected from inflation, then (and only then!) we have direct evidence for inflation! 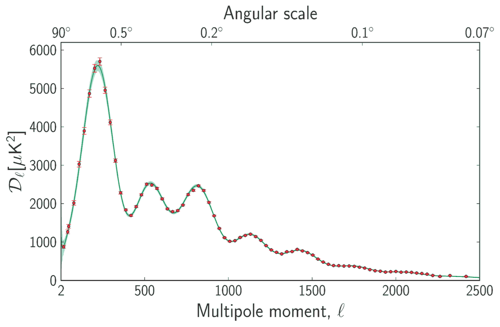 The figure shows the so-called power spectrum of the B-mode data — the horizontal “multipole” axis corresponds to angular sizes (θ) on the sky: very roughly, multipole &ell; ~ 180°/θ. The vertical axis gives the amount of “power” at those scales: it is larger if there are more structures of that particular size. 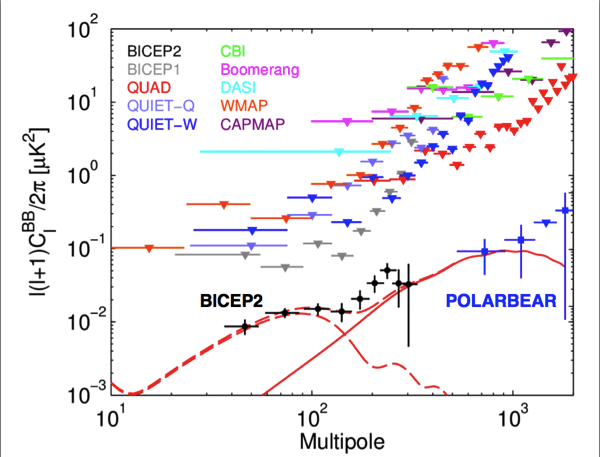 The downward pointing arrows are all upper limits; the error bars labeled BICEP2 and Polarbear are actual detections. The solid red curve is the expected signal from the lensing effect discussed above; the long-dashed red curve is the effect of gravitational radiation (with a particular amplitude), and the short-dashed red curve is the total B-mode signal from the two effects. The Polarbear results were announced on 11 March (disclosure: I am a member of the Polarbear team). These give a detection of the gravitational lensing signal. It was expected, and has been observed in other ways both in temperature and polarisation, but this was the first time it’s been seen directly in this sort of B-mode power spectrum, a crucial advance in the field, letting us really see lensing unblurred by the presence of other effects. We looked at very “clean” areas of the sky, in an effort to minimise the possible contamination from those astrophjysical foregrounds. The BICEP2 results were announced with a big press conference on 17 March. There are two papers so far, one giving the scientific results, another discussing the experimental techniques used — more papers discussing the data processing and other aspects of the analysis are forthcoming. But there is no doubt from the results that they have presented so far that this is an amazing, careful, and beautiful experiment. Taken at face value, the BICEP2 results give a pretty strong detection of gravitational radiation from the early Universe, with the ratio parameter r=0.20, with error bars +0.07 and -0.05 (they are different in the two different directions, so you can’t write it with the usual “±”). This is why there has been such an amazing amount of interest in both the press and the scientific community about these results — if true, they are a first semi-direct detection of gravitational radiation, strong evidence that inflation happened in the early Universe, and therefore a first look at waves which were created in the first tiny fraction of a second after the big bang, and have been propagating unimpeded in the Universe ever since. If we can measure more of the properties of these waves, we can learn more about the way inflation happened, which may in turn give us a handle on the particle physics of the early Universe and ultimately on a so-called “theory of everything” joining up quantum mechanics and gravity. Taken at face value, the BICEP2 results imply that the very simplest theories of inflation may be right: the so-called “single-field slow-roll” theories that postulate a very simple addition to the particle physics of the Universe. In the other direction, scientists working on string theory have begun to make predictions about the character of inflation in their models, and many of these models are strongly constrained — perhaps even ruled out — by these data. This is great. But scientists are skeptical by nature, and many of us have spent the last few days happily trying to poke holes in these results. My colleagues Peter Coles and Ted Bunn have blogged their own worries over the last couple of days, and Antony Lewis has already done some heroic work looking at the data. The first worry is raised by their headline result: r=0.20. On its face, this conflicts with last year’s Planck result, which says that r<0.11 (of course, both of these numbers really represent probability distributions, so there is no absolute contradiction between these numbers, but rather they should be seen to be as a very unlikely combination). How can we ameliorate the “tension” (a word that has come into vogue in cosmology lately: a wimpy way — that I’ve used, too — of talking about apparent contradictions!) between these numbers? First, how does Planck measure r to begin with? Above, I wrote about how B modes show only gravitational radiation (and lensing, and astrophysical foregrounds). But the same gravitational radiation also contributes to the CMB temperature, albeit at a comparatively low level, and at large angular scales — the very left-most points of the temperature equivalent of a plot like the above — I reproduce one from last year’s Planck release at right. In fact, those left-most data points are a bit low compared to the most favoured theory (the smooth curve), which pushes the Planck limit down a bit. But Planck and BICEP2 measure r at somewhat different angular scales, and so we can “ameliorate the tension” by making the theory a bit more complicated: the gravitational radiation isn’t described by just one number, but by a curve. If both data are to be believed, the curve slopes up from the Planck regime toward the BICEP2 regime. In fact, such a new parameter is already present in the theory, and goes by the name “tensor tilt”. The problem is that the required amount of tilt is somewhat larger than the simplest ideas — such as the single-field slow-roll theories — prefer. If we want to keep the theories simple, we need to make the data more complicated: bluntly, we need to find mistakes in either Planck or BICEP2. 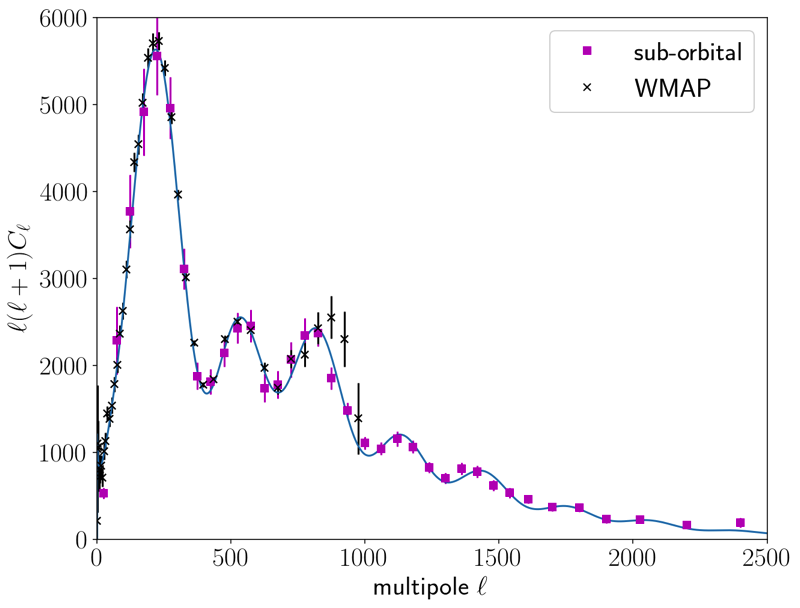 The large-scale CMB temperature sky has been scrutinised for the last 20 years or so, from COBE through WMAP and now Planck. Throughout this time, the community has been building up a catalog of “anomalies” (another term of art we use to describe things we’re uncomfortable with), many of which do seem to affect those large scales. The problem is that no one quite figure out if these things are statistically significant: we look at so many possible ways that the sky could be weird, but we only publish the ones that look significant. As my Imperial colleague Professor David Hand would point out, “Coincidences, Miracles, and Rare Events Happen Every Day”. Nonetheless, there seems to be some evidence that something interesting/unusual/anomalous is happening at large scales, and perhaps if we understood this correctly, the Planck limits on r would go up. But perhaps not: those results have been solid for a long while without an alternative explanation. So maybe the problem is with BICEP2? There are certainly lots of ways they could have made mistakes. Perhaps most importantly, it is very difficult for them to distinguish between primordial perturbations and astrophysical foregrounds, as their main results use only data from a single frequency (like a single colour in the spectrum, but down closer to radio wavelengths). They do compare with some older data at a different frequency, but the comparison does not strongly rule out contamination. They also rely on models for possible contamination, which give a very small contribution, but these models are very poorly constrained by current data. Another way they could go wrong is that they may misattribute some of their temperature measurement, or their E mode polarisation, to their B mode detection. Because the temperature and E mode are so much larger than the B they are seeing, only a very small amount of such contamination could change their results by a large amount. They do their best to control this “leakage”, and argue that its residual effect is tiny, but it’s very hard to get absolutely right. And there is some internal evidence within the BICEP2 results that things are not perfect. The most obvious one comes from the figure above: the points around &ell;=200 — where the lensing contributions begins to dominate — are a bit higher than the model. Is this just a statistical fluctuation, or is it evidence of a broader problem? Their paper show some somewhat discrepant points in their E polarisation measurements, as well. None of these are very statistically significant, and some may be confirmed by other measurements, but there are enough of these that caution makes sense. From only a few days thinking about the results (and not yet really sitting down and going through the papers in great depth), it’s hard to make detailed judgements. It seems like the team have been careful that it’s hard to imagine the results going away completely, but easy to imagine lots of ways in which it could be wrong in detail. But this skepticism from me and others is a good thing, even for the BICEP2 team: they will want their results scrutinised by the community. And the rest of us in the community will want the opportunity to reproduce the results. First, we’ll try to dig into the BICEP2 results themselves, making sure that they’ve done everything as well as possible. But over the next months and years, we’ll want to reproduce them with other experiments. First, of course, will be Planck. Since I’m on Planck, there’s not much I can say here, except that we expect to release our own polarisation data and cosmological results later this year. This paper (Efstathiou and Gratton 2009) may be of interest…. I first heard about the coming BICEP2 results in the middle of last week, when I was up in Edinburgh and received an email from a colleague just saying “r=0.2?!! ?” I quickly called to ask what he meant, and he transmitted the rumour of a coming BICEP detection, perhaps bolstered by some confirmation from their successor experiment, the Keck Array (which does in fact appear in their paper). Indeed, such a rumour had been floating around the community for a year or so, but most of thought it would turn out to be spurious. But very quickly last week, we realised that this was for real. It became most solid when I had a call from a Guardian journalist, who managed to elicit some inane comments from me, before anything was known for sure. By the weekend, it became clear that there would be an astronomy-related press conference at Harvard on Monday, and we were all pretty sure that it would be the BICEP2 news. The number r=0.20 was most commonly cited, and we all figured it would have an error bar around 0.06 or so — small enough to be a real detection, but large enough to leave room for error (but I also heard rumours of r=0.075). By Monday morning, things had reached whatever passes for a fever pitch in the cosmology community: twitter and Facebook conversations, a mention on BBC Radio 4’s Today programme, all before the official title of the press conference was even announced: “First Direct Evidence for Cosmic Inflation”. Apparently, other BBC journalists had already had embargoed confirmation of some of the details from the BICEP2 team, but the embargo meant they couldn’t participate in the rumour-spreading. I was traveling during most of this time, fielding occasional call from journalists (there aren’t that many CMB-specialists within within easy of the London-based media), though, unfortunately for my ego, I wasn’t able to make it onto any of Monday night’s choice tv spots. By the time of the press conference itself, the cosmology community had self-organised: there was a Facebook group organised by Fermilab’s Scott Dodelson, which pretty quickly started dissecting the papers and was able to follow along with the press conference as it happened (despite the fact that most of us couldn’t get onto the website — one of the first times that the popularity of cosmology has brought down a server). At the time, I was on a series of trains from Loch Lomond to Glasgow, Edinburgh and finally on to London, but the facebook group made (from a tech standpoint, it’s surprising that we didn’t do this on the supposedly more capable Google Plus platform, but the sociological fact is that more of us are on, and use, Facebook). It was great to be able to watch, and participate in, the real-time discussion of the papers (which continues on Facebook as of now). Cosmologists have been teasing out possible inconsistencies (some of which I alluded to above), trying to understand the implications of the results if they’re right — and thinking about the next steps. IRL, Now that I’m back at Imperial, we’ve been poring over the papers in yet more detail, trying to work exactly how they’ve gathered and analysed their data, and seeing what parts we want to try to reproduce. The next generation of large satellites: PRISM and/or eLISA? At least two of the ideas are particularly close to my scientific heart. 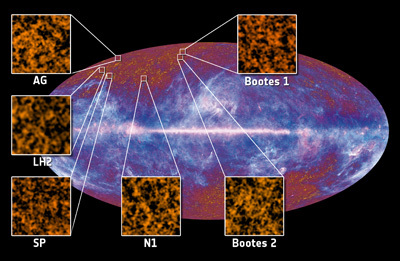 The Polarized Radiation Imaging and Spectroscopy Mission (PRISM) is a cosmic microwave background (CMB) telescope, following on from Planck and the current generation of sub-orbital telescopes like EBEX and PolarBear: whereas Planck has 72 detectors observing the sky over nine frequencies on the sky, PRISM would have more than 7000 detectors working in a similar way to Planck over 32 frequencies, along with another set observing 300 narrow frequency bands, and another instrument dedicated to measuring the spectrum of the CMB in even more detail. Combined, these instruments allow a wide variety of cosmological and astrophysical goals, concentrating on more direct observations of early Universe physics than possible with current instruments, in particular the possible background of gravitational waves from inflation, and the small correlations induced by the physics of inflation and other physical processes in the history of the Universe. The eLISA mission is the latest attempt to build a gravitational radiation observatory in space, observing astrophysical sources rather than the primordial background affecting the CMB, using giant lasers to measure the distance between three separate free-floating satellites a million kilometres apart from one another. As a gravitational wave passes through the triangle, it bends space and effectively changes the distance between them. The trio would thereby be sensitive to the gravitational waves produced by small, dense objects orbiting one another, objects like white dwarfs, neutron stars and, most excitingly, black holes. This would give us a probe of physics in locations we can’t see with ordinary light, and in regimes that we can’t reproduce on earth or anywhere nearby. Full disclosure: although I’ve signed up to support both, I’m directly involved in the PRISM white paper. Yesterday’s release of the Planck papers and data wasn’t just aimed at the scientific community, of course. We wanted to let the rest of the world know about our results. The main press conference was at ESA HQ in Paris, and there was a smaller event here in London run by the UKSA, which I participated in as part of a panel of eight Planck scientists. There are pieces by the reporters who asked excellent questions at the press conference, at The Guardian, The Economist and The Financial Times, as well as one behind the (London) Times paywall by Hannah Devlin who was probably most rigorous in her requests for us to simplify our explanations. I’ll also point to NPR’s coverage, mostly since it is one of the few outlets to explicitly mention the topology of the Universe which was one of the areas of Planck science I worked on myself. Aside from the press conference itself, the media were fairly clamouring for the chance to talk about Planck. Most of the major outlets in the UK and around Europe covered the Planck results. Even in the US, we made it onto the front page of the New York Times. Rather than summarise all of the results, I’ll just self-aggrandizingly point to the places where I appeared: a text-based preview from the BBC, and a short quote on video taken after the press conference, as well as one on ITV. I’m most proud of my appearance with Tom Clarke on Channel 4 News — we spent about an hour planning and discussing the results, edited down to a few minutes including my head floating in front of some green-screen astrophysics animations. Now that the day is over, you can look at the results for yourself at the BBC’s nice interactive version, or at the lovely Planck Chromoscope created by Cardiff University’s Dr Chris North, who donated a huge amount of his time and effort to helping us make yesterday a success. I should also thank our funders over at the UK Space Agency, STFC and (indirectly) ESA — Planck is big science, and these sorts of results don’t come cheap. I hope you agree that they’ve been worth it. My apologies for being far too busy to post. I’ll be much louder in couple of weeks once we release the Planck data — on March 21. Until then, I have to shut up and follow the Planck rules. Probably more important for my astrophysics colleagues: the Planck papers will be posted on the ESA website at noon on the 21st, after the press event, and will appear on the ArXiV the following day, 22 March. Be sure to set aside some time next weekend! Until now, I have been forced to resist the clamour brewing among both members of my extensive readership (hi, dad!) to post a bit more often: my excuse is that, in the little over a month between early September and mid-October, I have travelled back and forth from Paris to London five times, spent a weekend in the USA, started teaching a new course, and ran a half marathon. Ten one-way trips in six weeks is too many; the Eurostar makes it about as pleasant as it could possibly be: 2 1/4 hours from central London to central Paris by train (a flight from Heathrow to de Gaulle is faster, but the airports are less convenient and much more stressful). Most of my time in Paris was for Planck Satellite meetings, mostly devoted to the first major release of Planck data and papers next year — of course, by The Planck rules, I can’t talk about what happened. At least I have no more trips to Paris until early December (and only four or so hours a week of Planck telecons). But in addition to three Planck meetings, I also helped out in my minor role as a member of the Scientific Organizing Committee of the Big Bang, Big Data, Big Computing meeting at the APC, which was an excellent gathering of cosmologists with computer scientists and statisticians, all doing our best to talk over the fences of jargon and habit that often keep the different fields from having productive conversations. One of my favourite talks was the technical but entertaining From mean Euler characteristics to the Gaussian kinematic formula by Robert Adler, whose work in statistics more than thirty years ago taught many in cosmology how to treat the functions that we use to describe the distribution of density and temperature in the Universe as random fields; he discussed more recent updates to that early work for much more general circumstances, the cosmological repercussions of which have yet to be digested. Another highlight was from Imperial’s own Professor David Hand, Opportunities and Challenges in Modelling and Anomaly Detection, discussing how to pull small and possibly weird (“anomalous”) signals from large amounts of data— he didn’t highlight many specific instances in cosmology, but rather gave examples with other sorts of big data, such as the distribution of prices of credit card purchases (with some particularly good anecdotes culled from gas/petrol station data). Finally, in addition to those many days of meetings — and yes, the occasional good Parisian meal — there were a couple of instances of the most satisfying of my professional duties: two examinations for newly-minted PhDs from the Institut d’Astrophysiques de Paris and the Laboratoire Astroparticule et Cosmologie — félicitations aux Docteurs Errard et Ducout. 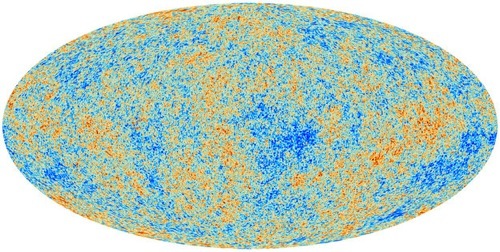 Planck’s High-Frequency Instrument (HFI) instrument must be cooled to 0.1 degrees above absolute zero, maintained at this temperature by a series of refrigerators — which had been making Planck the coldest known object in space, colder than the 2.7 degrees to which the cosmic microwave background itself warms even the most regions of intergalactic space. The final cooler in the chain relies on a tank of the Helium-3 isotope, which has finally run out, within days of its predicted lifetime — and giving Planck more than twice as much time observing the Universe as its nominal 14-month mission. The Low-Frequency Instrument (LFI) doesn’t require such cold temperatures, although in fact they do use one of the earlier stages in the chain, the UK-built 4-degree cooler, as a reference against which it compares its measurements. LFI will, therefore, continue its measurements for the next half-year or so. But our work, of course, goes on: we will continue to process and analyse Planck’s data, refining our maps of the sky, and get down to the real work of extracting a full sky’s worth of astrophysics and cosmology from our data. The first, preliminary, release of Planck data happened just one year ago, and yet more new Planck science will be presented at a conference in Bologna in a few months. The most exciting and important work will be getting cosmology from Planck data, which we expect to first present in early 2013, and likely in further iterations beyond that. Funding for space missions in the UK was split from the Science and Technology Facilities Council to the the UK Space Agency earlier this year. Very roughly, UKSA will fund the missions themselves all the way through to the processing of data, while STFC will fund the science that comes from analysing the data. This still leaves many of the details of the split unanswered, or at least fuzzy: How do we ensure that government supports the two agencies adequately and jointly? How do we ensure that STFC supports science exploitation from missions that UKSA funds, so that the UK gets the full return on its investment? How do we define the split between “data analysis” and “science exploitation”? Here at Imperial, we work on both sides of that divide for both Planck and Herschel: we are the home to data analysis centres for both missions, and want to take advantage of the resulting science opportunities. Indeed, as we take the Planck mission ahead towards its first cosmology results at the end of next year, we are already seeing some of these tensions played out, in both the decision-making process of each agency separately as well as in the overall level of funding available in these austere times. What are blogs for, if not self-publicity? In that vein, I’ll be appearing at the Spacetacular! night on April 12, in honor of Yuri’s night: the 50th anniversary of Yuri Gagarin’s first-ever manned space flight. The evening is organized by Londonist editor Matt Brown along with comedian and presenter Helen Keen, hosting a line-up of comedians and scientists. I promise not to be funny so you can tell which I am — I’ll be talking for ten minutes or so about my adventures in space (well, working on a big space-based project, the Planck Surveyor Satellite). We scientists often, and correctly, make the point that manned space flight has almost nothing to do with science. But I certainly wouldn’t be the scientist I am if it weren’t a morning long ago in Hooks Lane Nursery School watching one of those early moon launches, thinking I wanted to have something, anything, to do with that. So let us know if you want to come celebrate [the Facebook event link is currently broken, but this one is still up.] this amazing human achievement with comedy and science (and spacey costumes) at the Camden Head Pub in London next week. Many of my colleagues in the EBEX experiment have just lit out for the west. Specifically, the team is heading off to Palestine (pronounced “Palesteen”), Texas, to get the telescope and instrument ready for its big Antarctic long-duration balloon flight at the end of the year, when we hope to gather our first real scientific data and observe the temperature and polarization of the cosmic microwave background (CMB) radiation. Unlike the Planck Satellite, which has a few dozen detectors changed little from those that flew on MAXIMA and BOOMEReNG in the 1990s, EBEX can use more modern technology, and will fly with thousands of detectors, allowing us to achieve far greater sensitivity to the smallest variations in the CMB. And if you want a change from cosmology, you can instead follow along with another friend, Marc, who is trying to see if he can come to grips with writing on an iPad in the supposedly post-PC world, over at typelesswriter. One of the perks (perqs?) of academia is that occasionally I get an excuse to escape the damp grey of London Winters. The Planck Satellite is an international collaboration and, although largely backed by the European Space Agency, it has a large contribution from US scientists, who built the CMB detectors for Planck’s HFI instrument, as well as being significantly involved in the analysis of Planck data. 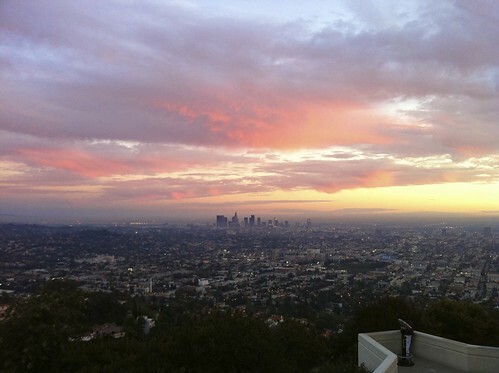 Much of this work is centred at NASA’s famous Jet Propulsion Lab in Pasadena, and I was happy to rearrange my schedule to allow a February trip to sunny Southern California (I hope my undergraduate students enjoyed the two guest lectures during my absence). And even better, I got to share these meals and views with old and new friends. 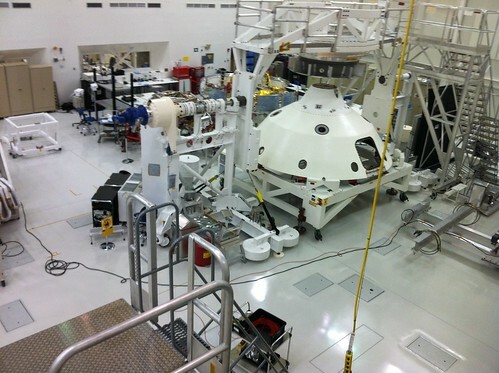 The white pod-like structure is the spacecraft itself, which will parachute into Mars’ atmosphere in a few years, and from it will descend the circular “sky crane” currently parked behind it which will itself deploy the car-sized Curiosity Rover to do the real work of Martian geology, chemistry, climatology and (who knows?) biology. But my own work was for the semi-annual meeting of the Planck CTP working group (I’ve never been sure if it was intentional, but the name always seemed to me a sort of science pun, obliquely referring to the famous “CPT” symmetry of fundamental physics). In Planck, “CTP” refers to Cℓ from Temperature and Polarization: the calculation of the famous CMB power spectrum which contains much of the cosmological information in the maps that Planck will produce. 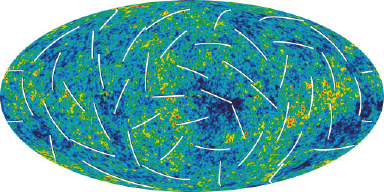 The spectrum allows us to compress the millions of pixels in a map of the CMB sky, such as this one from the WMAP experiment (the colors give the temperature or intensity of the radiation, the lines its polarization), into just a few thousand numbers we can plot on a graph. OK, this is not a publishable figure. 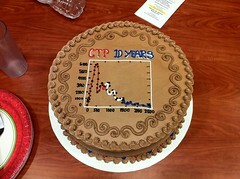 Instead, it marks the tenth anniversary of the first CTP working group telecon in February 2001 (somewhat before I was involved in the group, actually). 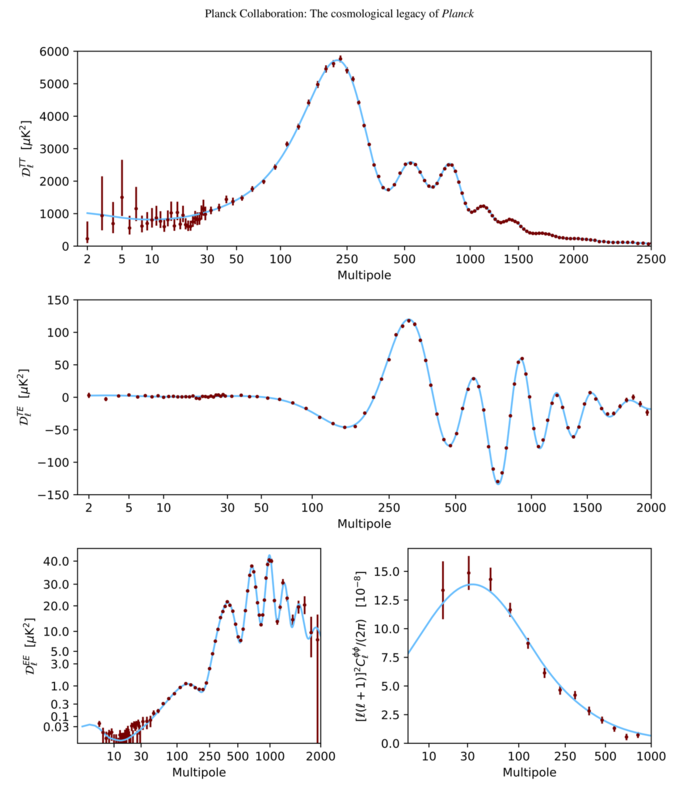 But given that we won’t be publishing Planck cosmology data for another couple of years, sugary spectra will have to do instead of the real ones in the meantime. The work of the CTP group is exactly concerned with finding the best algorithms for translating CMB maps into these power spectra. They must take into account the complicated noise in the map, coming from our imperfect instruments which observe the sky with finite resolution — that is, a telescope which smooths the sky at a scale from about half down to one-tenth of a degree — and with a limited sensitivity — every measurement has a little bit of unavoidable noise added to it. Moreover, in between the CMB, produced 400,000 years after the Big Bang, and Planck’s instruments, observing today, is the entire rest of the Universe, which contains matter that both absorbs and emits (glows) in the microwaves which Planck observes. So in practice we need to simultaneously deal with all of these effects when reducing our maps down to power spectra. This is a surprisingly difficult problem: the naive, brute-force (Bayesian), solution requires a number of computer operations which scales like the cube of the number of pixels in the CMB map; at Planck’s resolution this is as many as 100 million pixels, and there still are no supercomputers capable of doing the septillion (1024) operations in a reasonable time. If we smooth the map, we can still solve the full problem, but on small scales, we need to come up with useful approximations which take advantage of what we know about the data, usually taking advantage of the very large number of points that contribute, and the so-called asymptotic theorems which say, roughly, that we can learn about the right answer by doing lots of simulations, which are much less computationally expensive. At the required levels of both accuracy and precision, the results depend on all of the details of the data processing and the algorithm: How do you account for the telescope’s optics and the pixelization of the sky? How do you model the noise in the map? How do you remove those pixels contaminated by astrophysical emission or absorption? All of this is compounded by the necessary (friendly) scientific competition: it is the responsibility of the CTP group to make recommendations for how Planck will actually produce its power spectra for the community and, naturally, each of us wants our own algorithm or computer program to be used — to win. So these meetings are as much about politics as science, but we can hope that the outcome is that all the codes are raised to an appropriate level and we can make the decisions on non-scientific grounds (ease of use, flexibility, speed, etc.) that will produce the high-quality scientific results for which we designed and built Planck — and have worked on it for the last decade or more. I’ve been meaning to give a shout-out to my colleagues on the ADAMIS team at the APC (AstroParticule et Cosmologie) Lab at the Université Paris 7 for a while: in addition to doing lots of great work on Planck, EBEX, PolarBear and other important CMB and cosmology experiments, they’ve also been running a group blog since the Autumn, Paper(s) of the Week et les autres choses (scientifique) which dissects some of the more interesting work to come out of the cosmology community. In particular, one of my favorite collaborators has written an extremely astute analysis of what, exactly, we on the Planck team released in our lengthy series of papers last month (which I have already discussed in a somewhat more boosterish fashion). After all this time, we on the team are very excited to produce our very first scientific results. These take the form of a catalog of sources detected by Planck, along with 25 papers discussing the catalog as well as the more diffuse pattern of radiation on the sky. 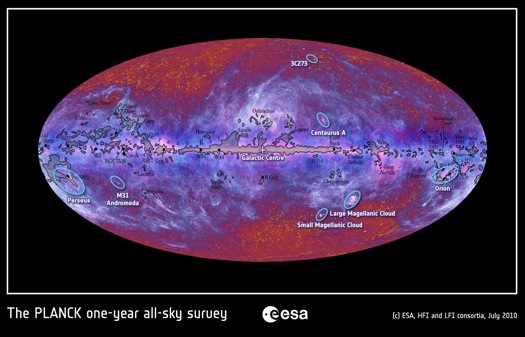 Planck is the very first instrument to observe the whole sky with light in nine bands with wavelengths from about 1/3 of a millimeter up to one centimeter, an unprecedented range. In fact this first release of data and papers discusses Planck as a tool for astrophysics — as a telescope observing distant galaxies and clusters of galaxies as well as our own Galaxy, the Milky Way. 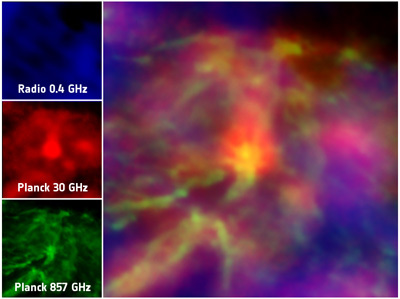 All of these glow in Planck’s bands (indeed they dominate over the CMB in most of them), and with our high-sensitivity all-sky maps we have the opportunity to do astronomy with Planck, the best microwave telescope ever made. Indeed, to get to this point, we actually have to separate out the CMB from the other sources of emission and, somewhat perversely, actively remove that from the data we are presenting. Over the last year, then, we on the Planck team have written about 25 papers to support this science; a few of them are about the mission as a whole, the instruments on board Planck, and the data processing pipelines that we have written to produce our data. Then there are a few papers discussing the data we are making available, the Early Release Compact Source Catalog and the various subsets discussing separately objects within our own Milky Way Galaxy as well as more distant galaxies and clusters of galaxies. The remaining papers give our first attempts at analyzing the data and extracting the best science possible. In addition, Planck has found more than twenty new clusters of galaxies, has mapped the dust in gas in the Milky Way in three dimensions, and uncovered cold gas in nearby galaxies. And this is just the beginning of what Planck is capable of. We have not yet begun to discuss the cosmological implications, nor Planck’s abilities to measure not just the intensity of light, but also its polarization. Of course the most important thing we have learned so far is how hard it is to work in a team of 400 or so scientists, whom — myself included — like neither managing nor being managed (and are likewise not particularly skilled at either). I’ve been involved in a small way in the editing process, shepherding just a few of those 25 papers to completion, paying attention to the language and presentation as much as the science. Given the difficulties, I am relatively happy with the results — the papers can be downloaded directly from ESA, and will be available on the ArXiV on 12 January 2011, and will eventually be published in the journal Astronomy and Astrophysics. It will be very interesting to see how we manage this in two years when we may have as many as a hundred or so papers at once. Stay tuned. I spent part of this week in Paris (apparently at the same time as a large number of other London-based scientists who were here for other things) discussing whether the European CMB community should rally and respond to ESA’s latest call for proposals for a mission to be launched in the next open slot—which isn’t until around 2022. As successful as Planck seems to be, and as fun as it is working with the data, I suspect that no one on the Planck team thinks that a 400-scientist, dispersed, international team coming from a dozen countries each with its own politics and funding priorities, is the most efficient way to run such a project. But we’re stuck with it—no single European country can afford the better part of a billion Euros it will cost. Particle physics has been in this mode for the better part of fifty years, and arguably since the Manhattan Project, but it’s a new way of doing things — involving new career structures, new ways of evaluating research, new ways of planning, and a new concentration upon management — that we astrophysicists have to develop to answer our particular kinds of scientific questions. But a longer discussion of “big science” is for another time. The next CMB satellite will probably be big, but the coming ESA call is officially for an “M-class” (for “medium”) mission, with a meagre (sic) 600 million euro cap. What will the astrophysical and cosmological community get for all this cash? How will it improve upon Planck? Well, Planck has been designed to mine the cosmic microwave background for all of the temperature information available, the brightness of the microwave sky in all directions, down to around a few arcminutes at which scale it becomes smooth. But light from the CMB also carries information about the polarisation of light, essentially two more numbers we can measure at every point. Planck will measure some of this polarisation data, but we know that there will be much more to learn. We expect that this as-yet unmeasured polarisation can answer questions about fundamental physics that affects the early universe and describes its content and evolution. What are the details of the early period of inflation that gave the observable Universe its large-scale properties and seeded the formation of structures in it—and did it happen at all? What are the properties of the ubiquitous and light neutrino particles whose presence would have had a small but crucial effect on the evolution of structure? The importance of these questions is driving us toward a fairly ambitious proposal for the next CMB mission. It will have a resolution comparable to that of Planck, but with many hundreds of individual detectors, compared to Plank’s many dozens—giving us over an order of magnitude increase in sensitivity to polarisation on the sky. Actually, even getting to this point took a good day or two of discussion. Should we instead make a cheaper, more focused proposal that would concentrate only on the question oaf inflation and in particular upon the background of gravitational radiation — observable as so-called “B-modes” in polarisation — that some theories predict? The problem with this proposal is that it is possible, or even likely, that it will produce what is known as a “null result”—that is, it won’t see anything at all. Moreover, a current generation of ground- and balloon-based CMB experiments, including EBEX and Polarbear, which I am lucky enough to be part of, are in progress, and should have results within the next few years, possibly scooping any too-narrowly designed future satellite. So we will be broadening our case beyond these B-modes, and therefore making our design more ambitious, in order to make these further fundamental measurements. And, like Planck, we will be opening a new window on the sky for astrophysicists of all stripes, giving measurements of magnetic fields, the shapes of dust grains, and likely many more things we haven’t yet though of. One minor upshot of all this is that our original name, the rather dull “B-Pol”, is no longer appropriate. Any ideas? The Planck Satellite was launched in May 2009, and started regular operations late last summer. This spring, we achieved an important milestone: the satellite has observed the whole sky. 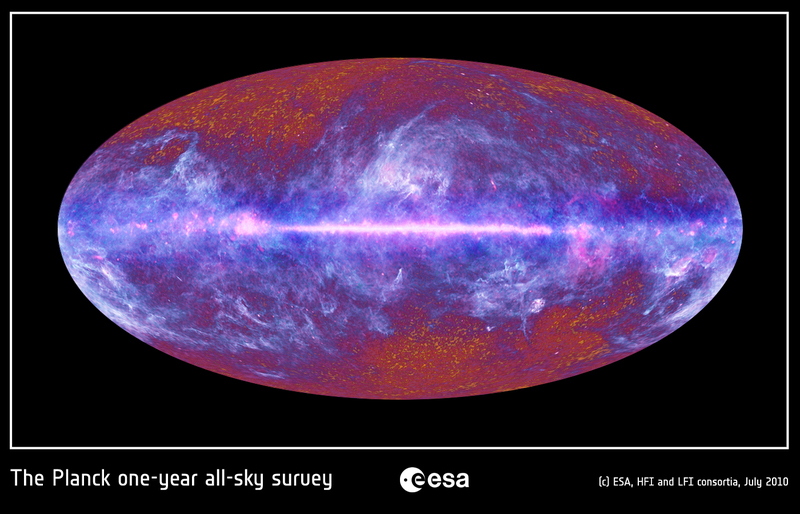 To celebrate, the Planck team have released an image of the full sky. 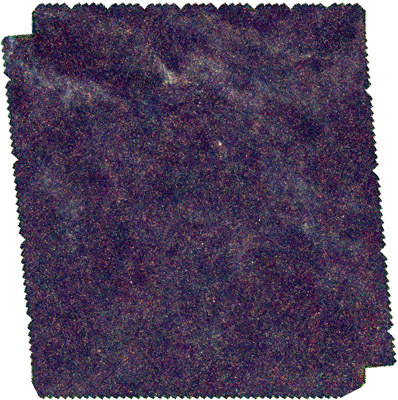 The telescope has detectors which can see the sky with 9 bands at wavelengths ranging from 0.3 millimeters up to nearly a centimeter, out of which we have made this false-color image. The center of the picture is toward the center of the Galaxy, with the rest of the sphere unwrapped into an ellipse so that we can put it onto a computer screen (so the left and right edges are really both the same points). At the longest and shortest wavelengths, our view is dominated by matter in our own Milky Way galaxy — this is the purple-blue cloud, mostly so-called galactic “cirrus” gas and dust, largely concentrated in a thin band running through the center which is the disk of our galaxy viewed from within. Even though Planck is largely a cosmology mission, we expect these galactic and extragalactic data to be invaluable to astrophysicists of all stripes. Buried in these pictures we hope to find information on the structure and formation of galaxies, on the evolution of very faint magnetic fields, and on the evolution of the most massive objects in the Universe, clusters of galaxies. But there is plenty of cosmology to be done: we see the Cosmic Microwave Background (CMB) in the red and yellow splotches at the top and bottom — out of the galactic plane. We on the Planck team will be spending much of the next two years separating the galactic and extragalactic “foreground” emission from the CMB, and characterizing its properties in as much detail as we can. Stay tuned. Results from the first major science papers from the Herschel Satellite were released this week at a conference in Holland. 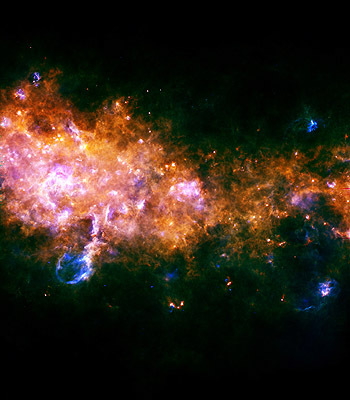 Launched almost a year ago on the same rocket as Planck, Herschel is an infrared and sub-millimeter telescope, which lets it see not only the stars that generate the visible light we see with our eyes and ordinary cameras, but also the gas and dust that absorb and re-radiate that light. That gas and dust carries information about both the birth and death of stars: the detritus of exploding stars﻿ pollutes the interstellar medium, which eventually condenses out to form new generations of stars. On larger scales, Herschel’s observations let us trace the evolution of entire galaxies, the most important tracers of large-scale structure, formed from seeds laid down somehow in the first instants of the Universe (and, bringing it all back to cosmology, which are viewed by Planck in a much earlier form). My Imperial colleagues and Herschel scientists Dave Clements and Brian O’Halloran discuss the results in much more detail over on the Herschel mission blog, or you can keep more up to date on twitter. But I’ll just steal some of their bandwidth and show some pretty pictures. Not coincidentally, Imperial’s Michael Rowan-Robinson, who has been doing infrared astronomy for several decades, appeared on BBC radio 4’s wonderful In Our Time this morning to discuss “The Cool Universe”: covering a century or so of infrared astronomy in forty-five minutes. We on Planck won’t be coming out with any papers for quite a while. However, many members of the team gathered in Orsay, outside of Paris, this week, to discuss the progress of the observations (and our analyses) and, crucially, to start talking in more detail about the actual papers that we’ll be writing over the next few years. More generally, Planck is doing pretty well. It came out first in NASA’s latest round of evaluations (which is a significant achievement for a mission primarily run by ESA), and which we hope will also give further impetus to keep funds flowing in the UK. This is especially important as the length of the Planck mission is likely to be almost doubled, allowing us to extract even more science than we originally hoped. I can’t say much more, except that we’ve got a lot of — very exciting — work ahead of us. The cosmology community has had a terrible few months. I am saddened to report the passing of Andrew Lange, a physicist from CalTech and one of the world’s preeminent experimental cosmologists. Among many other accomplishments, Andrew was one of the leaders of the Boomerang experiment, which made the first large-scale map of the Cosmic Microwave Background radiation with a resolution of less than one degree, sufficient to see the opposing action of gravity and pressure in the gas of the early Universe, and to use that to measure the overall density of matter, among many other cosmological properties. He has since been an important leader in a number of other experiments, notably the Planck Surveyor satellite and the Spider balloon-borne telescope, currently being developed to become one of the most sensitive CMB experiments ever built. I learned about this tragedy on the same day that people are gathering in Berkeley, California, to mourn the passing of another experimental cosmologist, Huan Tran of Berkeley. Huan was an excellent young scientist, most recently deeply involved in the development of PolarBear, another one of the current generation of ultra-sensitive CMB experiments. Huan lead the development of the PolarBear telescope itself, currently being tested in the mountains of California, but to be deployed for real science on the Atacama plane in Chile. We on the PolarBear team are proud to name the PolarBear telescope after Huan Tran, a token of our esteem for him, and a small tribute to his memory. My thoughts go out to the friends and family of both Huan and Andrew. I, and many others, will miss them both.